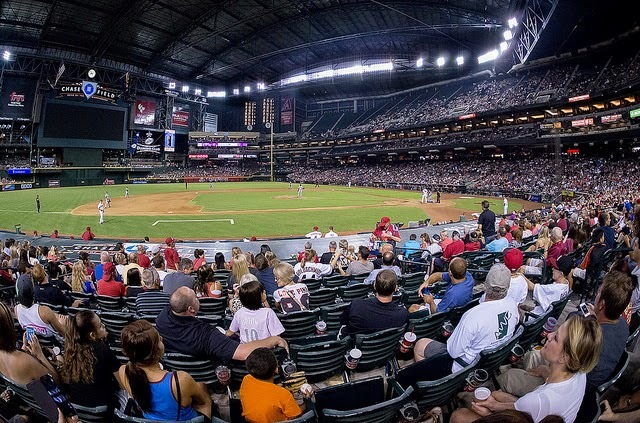 Chase Field was my local ballpark for seven years. So. At the time that I write this (prior to end of the last Dodgers game), the Reds are in the midst of a 4-game losing streak. They're 7.5 games behind the Brewers. And thanks to a modest surge by the Pirates, the Reds now sit in 4th place in the NL Central. Finally, the Reds' playoff odds, according to both FanGraphs and Baseball Prospectus, have dropped below 10% for the first time this season. It's a tough time. The offense has been very poor, and the bullpen has been even worse. Despite the strong performances by the starting pitching, the Reds have been a sub-0.500 team, in terms of both real wins and PythagenPat record. Is there hope? Sure. Latos and Votto could return, Bruce could catch fire, Frazier & Mesoraco & Cueto and the rest could keep on keepin' on, and the Reds could go on a tear. But they're at the point that they will need to go on a heck of a run to get back into contention. The Reds return to my old haunts. I spent 7 years in Phoenix (hence the AZ in my username), and for a lot of that I lived only about 10 minutes away from the ballpark in South Phoenix. As a result, I've probably seen more games there than any park other than Riverfront. It's a really nice place to take in a game. I never thought I'd like indoor baseball. But when the heat is blazing outside, it was an incredibly comfortable, pleasant place to kick back and enjoy a ballgame. It's the place where my oldest "saw" her first ballgame as a two-month old (the night of Carlos Quintin's debut, when he hit his first major league home run), and where I got to watch live games in the first World Baseball Classic. I also got to see a 2007 playoff game there (Cubs v. Dbacks), which was the only playoff game I've ever attended in person (go ahead, make fun of me). I have pretty great memories of that ballpark.